Much of the controversy and debate in modern American life revolves around such public policy issues as abortion, gun control, health care, and immigration. 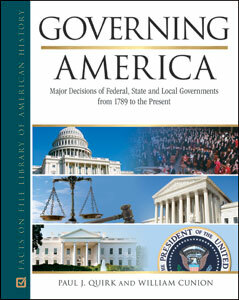 Governing America is a three-volume collection of essays designed to give readers the complete story behind the major policy issues of the 21st century. This comprehensive resource takes a unique perspective on public policy issues and presents them in historical context. Controversial issues along with the history of the U.S. government's involvement in these debates are examined in great detail by experts in the field.